Shiftboard is the top choice for higher education staff scheduling software for many universities. Shiftboard’s scheduling software works so well for higher education institutions because Shiftboard is a member of the InCommon Federation, so Shiftboard allows for single user sign-on through Shibboleth. Once activated, student employees can easily log in to Shiftboard through their student portal. This streamlines user access while eliminating any confusion about where student employees can find their work schedules. Simplify management of student employees, while streamlining the scheduling process–no matter how large the workforce or how complicated the schedule. Managing overtime comes with the territory when scheduling student employees. This is particularly true for work study programs with strict rules on student work periods. Fortunately, Shiftboard helps alleviate the risk of too much overtime. Shiftboard’s education staff scheduling software can prevent over-scheduling student employees. Our software allows the scheduler to set predefined limits on the number of hours students can work. Shiftboard do this on a per-day or per-week basis, depending on how limits are structured and what makes sense for a particular workforce. Students and full-time employees want to have a say in their work schedules. Shiftboard’s education staff scheduling software makes this possible, even when there are hundreds of employees scheduled. Employees can set their availability, document preferences for manager consideration, and trade shifts with manager approval. Using education staff scheduling software to manage availability increases student employees’ ability to participate in the scheduling process. This makes them more likely to show up and execute their roles. Additionally, student workers often need flexible scheduling options. So while easy availability management helps in any workplace, it means scheduling student employees in particular is much easier. From campus security to libraries to college athletics centers, each department has unique scheduling needs for their workforce. Shiftboard is incredibly configurable and can accommodate this complexity. Flexible team management structure and multiple clock-in options meet the needs of different locations. Additionally, Shiftboard has geolocation features to ensure that student workers and full time employees are in the right place at the right time. Things happen. People get sick, shifts get canceled, classes run over, or details change. Shiftboard makes it effortless to contact your full-time workers or student employees with our iOS and Android app, or our text messaging service. Schedulers don’t have to depend on outdated phone trees and inactive messaging boards to fill last-minute spots in the schedule. Shift-based workers on campus benefit from the additional clarity, too. Additionally, venue staff management on campus is made easier–any last-minute changes can be easily communicated within Shiftboard. Students especially have dynamic schedules and many obligations. The schedule must be built around these obligations, which can be a huge challenge–even more so if there are dozens or hundreds of employees to schedule. However, great communication means more flexibility and less scheduling work for everyone. Both student workers and full time employees benefit from the communication tools built into Shiftboard’s staff scheduling software for higher education. Applicant Screening — Manage class turnover by optimizing your hiring process. Use online job applications and track new hires with custom profiles automatically generated with Shiftboard’s Applicant Tracking. Training & Credential Tracking — Stay up to date on all your employee certifications, including food handlers’ permits and CPR certification, with credential management. Shiftboard also allows you to easily track any required or optional job training and will automatically alert those with soon to expire credentials. Worker Pool Segmentation — Optimize your employee scheduling process by organizing your workers into teams. The most common ways teams are organized are by role, job location, or certification. You can also distinguish between student employees and full time employees. Shiftboard allows your to pick what works best for your department. Auto Assignments — Cut time spent manually creating schedules by using the Shiftboard bulk assignment feature. Simply input the requirements for each role such as time, date, certifications, and Shiftboard will find the ideal candidates based on their availability and certifications. Standby Lists — Create a backup plan for when student schedules change or when an employee calls in sick by building standby list in Shiftboard. Instead of scrambling to find a replacement, simply choose from pre-approved candidates. Shift Trading — Student employees and full-time workers often rely on Facebook groups or texting friends to trade shifts. 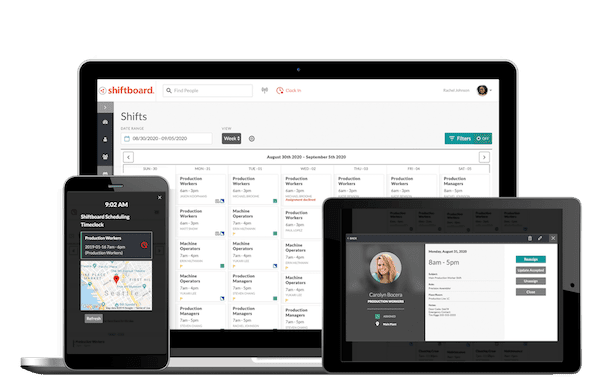 Shiftboard’s Tradeboard feature helps organize this process by allowing workers to offer shifts to others while still allowing the scheduler to allow or reject the trade. Mobile App — Communicate instantly with anyone on our iOS and Android apps. allow workers to quickly check their work schedules, clock-in, and view directions to their jobsite. Shiftboard ensures that all the necessary information is available when your workers need it. This is especially helpful for on-the-go student employees and full time workers who prefer to have communications on their mobile devices. Broadcast Emails — Reach your entire student workforce, a select of group employees, or a few individuals by leveraging the Shiftboard versatile bulk communication tool. This tool allows your to send emails and respond to questions in manageable format. Text Alerts & Shift Confirmation — Many students prefer texts to emails for quick communication. Shiftboard offers premium two-way texting and broadcast messaging options where both student workers and full time employees can sign up for a new shift by confirming with a unique code in a text message. Time clock — Many student roles have varying work locations that can make clocking in challenge. It can be even more challenging when there are dozens of workers at several locations across campus. Shiftboard offers several options to make it easy for in- the- field student workers or employees to clock in and out, including QR codes, interactive voice, and mobile check-in. Hours Tracking — Manual tracking of work hours can result in small clerical mistakes or large overtime penalties. Shiftboard automatically tracks hours worked, pay-rates, and prevents employees from being able to alter time cards. Integration with Payroll — Kronos, ADP, Ceridian, and Quickbooks are only a few of the hundreds of payroll providers that Shiftboard integrates with today. With these integrations, schedules are easily exported, time cards are formatted easily, and payroll systems are fully automated.